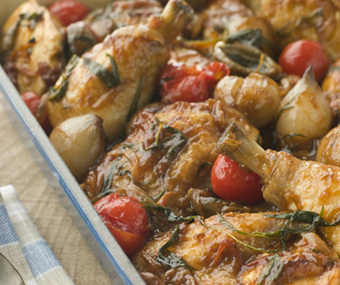 Season the chicken with the salt and pepper and heat the olive oil in a lidded sauté pan or shallow casserole dish. Pan-fry the chicken over a medium-high heat, turning until golden on both sides. Remove from the pan and keep to one side. Drain off the majority of excess fat left in the pan as you will only need about 2tbsp in the pan to cook the shallots and mushrooms. Return the pan to the heat and add the shallots and mushrooms, stir intermittently until they are beginning to soften and have taken some colour (usually about 6-8 mins). Now add the white wine and tomato purée followed by the stock whilst gently stirring continuously. Now return the chicken to the pan and bring ingredients to a simmer. Place a lid on the pan and continue to let the ingredients simmer for about 1 hour or until the chicken is tender and cooked through. To finish, allow the ingredients to cool slightly in the pan so you can skim off any excess fat which settles at the surface before adding the tomatoes. Finally simmer without the lid for an additional 3-4 mins to soften the tomatoes before scattering over the chopped tarragon and parsley. Stay in touch and receive exclusive offers straight to your inbox.